Lighting-Gallery-net - Various/Well, well, look at that ! Well, well, look at that ! Look what popped up on my property ! Well, not really, I put it there. This is a work in progress. I acquired a NEMA head from church, and I installed it without a lens among trees. The slightly greened out lamp is a GE from the 1990's (I think) and was initially installed in my Cooper Vanguard. I'm not sure what will become of this eventually, but it is plug in for now, with a temporary power cord, obviously. This will be to the delight of the fans of day burning worn MV. The photocell is taped shut for the moment, it will become functional when testing is done. 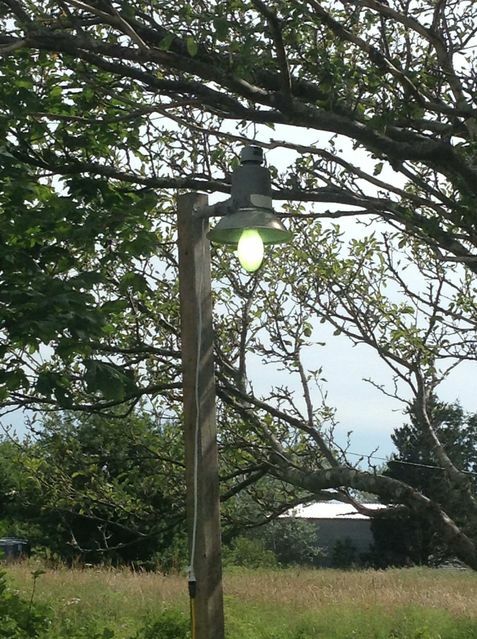 How did you mount the bucket light to the wood post if it isn't a yardblaster? It has a very short pipe, probably 8-10 inches, maybe slightly more. It was most likely sold with it and you could either keep it or use something else that is sold separately. Most NEMA heads here have that short pipe.